A few bloggers got the opportunity to try out a gym local for a month, courtesy of MoneySupermarket.com in order to see whether they feel like it's worth the expense as part of the Gym for the Win initiative. Living a healthy lifestyle means eating the right foods AND exercising as party of your weekly routine. I have the food bit covered (apart from gin and cake on weekends) and have charted my struggles with this on my other blog Where Are My Knees. I'm close to -6 stone since the beginning of my journey with Weight Watchers but I hit a bit of a plateau at the end of 2012 and haven't lost any weight since. I had always been put off by the gym, I tried it at uni and quickly became bored and stopped going. Also my weight loss motivation was never to look super athletic, I just wanted to be size 14/16 so I didn't have to shop solely at Evans or ASOS Curve anymore. Now I'm a little older I'm far less worried about clothes much more health focused and I know that I really do need to dedicate a little bit of team each week to getting into shape. The price of the gym had always put me off too, gyms near work in Cardiff can cost around £50+ a month and have lots of fancy features that I would never use and always seemed like a waste of money. £50 is a new dress, a big night out and a new nail polish or £50 towards my buying a flat fund. I found that my local council run gym offered gym, pool use and classes for just £30 a month and it's less than a 5 minute walk from my house so I was sold. Another thing that put me off the gym is that you can't wear black tights and a cardigan there, I have to wear ugly trainers and trousers, yuk. 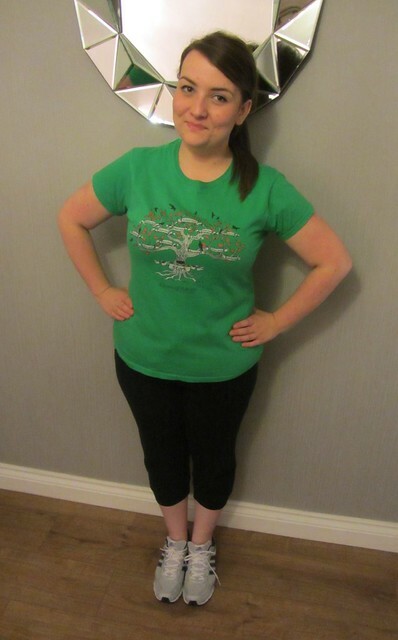 I made it less rubbish by wearing band t-shirts and my Stark family tree t-shirt but might invest in some proper kit if I keep up my gym attendance for a few months. I've been going three time a week on average and sometimes fitting in a Zumba class before doing some weights in the gym. I've lost 5lbs so far and I'm feeling so much better. My months subscription ends next week but I will definitely be renewing it. I think £30 a month is good value for the results I've seen. I will never LOVE the gym and I will always feel like there are more important things I could be doing with my time like reblogging photos of David Tennant on tumblr but it's worthwhile and even though I don't love it I do love the results. The gym is something I've always had to push myself to use. One method I use is work out how many times a month you have to go to get your money back, and then any extra give yourself a £1 for what your saving for. It does work when you see the money mounting up! Ugh the gym. Being a social recluse in need of losing weight the thought of going to a gym terrifies me! I've just found a youtube channel with a bunch of high intensity workouts so im going to give them a go and see how it treats me. Mega thumbs up for your start family tree top :D you looking forward to the new episode? I can't wait! Congrats on making it to the gym, keep at it, it will soon become part of your routine, and just something you do. And it makes weight loss and maintenance that little bit easier! I have just started going to the gym near me and I quite enjoy it, it is basically a teeny room like an oven but it's usually deserted so I can swweat away in peace, haha! Oh the gym. I started going to one in Cardiff which is only £19 a month and it's going well. The cheaper gym price means I can afford to get a personal trainer which has been AMAZING. It's hard to stay motivated at the beginning but once you see your body changing and your fitness going up it's a great motivator. Good luck!